Meeting Place: Max Fry Hall, Gorge Road Trevallyn. When: the third Tuesday in each month (except December and January) at 7.30pm. 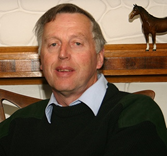 Knowledgeable, experienced guest speakers relevant to our interests with a few "Club Nights" with excellent presentations by well informed members. 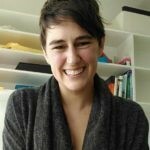 A warm welcome is extended to persons interested in native plants to attend our meetings as a guest. There is no charge and supper is served after the presentation giving an opportunity to socialise with the speakers and members. 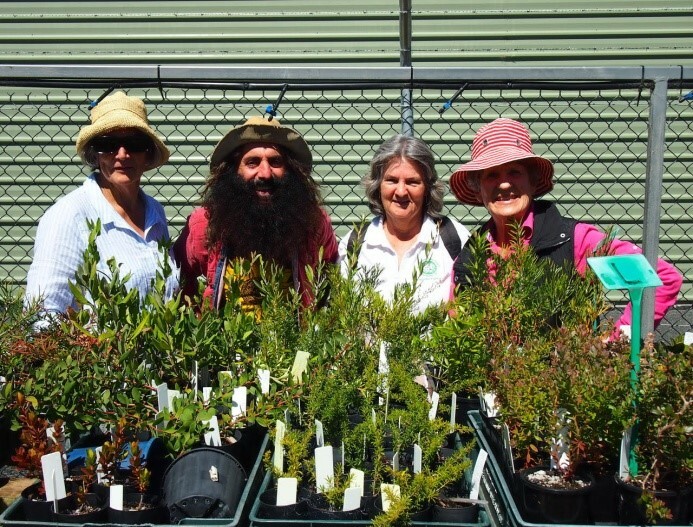 Propagation and sale of plants is the activity by which the Northern Group of the APST gains revenue to enable us to support the nursery, Tasmanian Native Garden, guest speakers and other administrative costs. 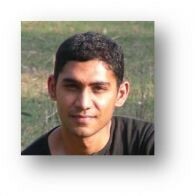 Any surplus is donated to worthy organisations whose aims are similar to our Society. 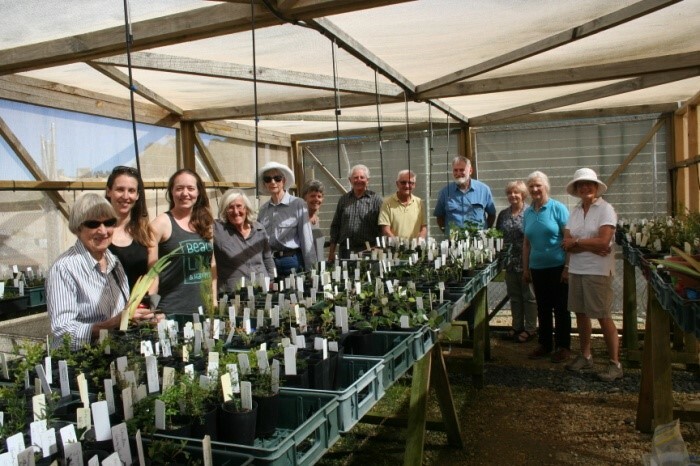 Propagation sessions are held at our nursery in the Windsor Community Precinct in Riverside on the first Saturday in each month from 1:00 pm to 3:00 pm. Visitors and members are always welcome to participate in a very pleasant afternoon which is both instructional and educational about propagating and growing native plants. We conclude with a friendly chat and a cup of tea or coffee, and cakes. Plants sales to the public are held each autumn and spring at Max Fry Hall in Trevallyn. This is becoming increasingly popular due to the quality and diversity of our native plants. > Private properties at Mt Read on the West Coast (the home of the ancient Huon Pine) and private Midlands and NE estates. > The magnificent art archives of botanical works by Margaret Stones, William Gould and Ellis Rowan at the Queen Victoria Museum and Art Gallery. > Bluff River Gorge and Winifred Curtis Reserve on the East Coast. 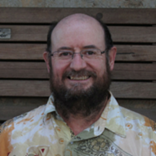 > Bridport, Four Springs Lakes, Powranna and Tom Gibson Reserves. 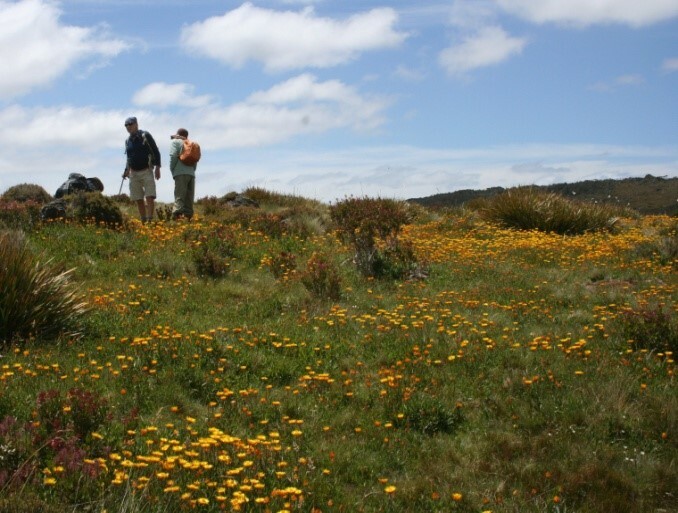 > Alpine plains at Mt Barrow, February Plains and Surrey Hills in the NW, as well as our National Parks. > Members' gardens, the Arboretum and the Royal Tasmanian Botanical Gardens. 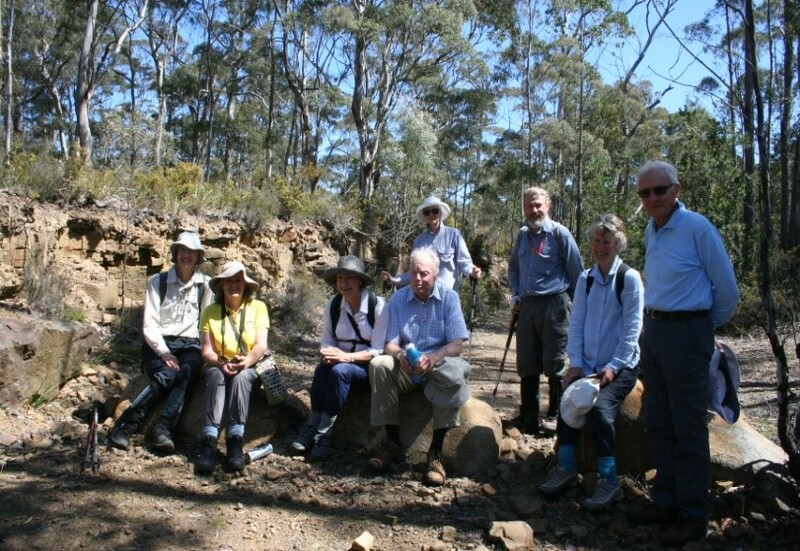 > Organise outings with other groups such as the Launceston Field Naturalists Club and the NW and southern groups of the Australian Plant Society. 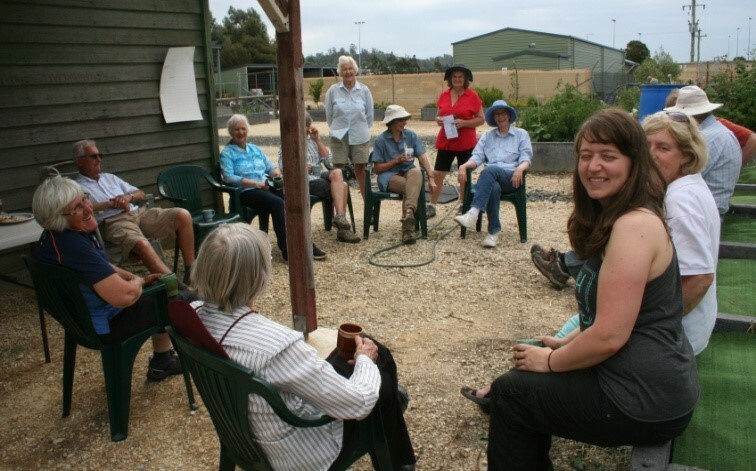 Every 4th Tuesday of the month, from 9:30 to 11:30 am Native Plant Society members meet to weed, water and tend the garden followed by a social cuppa and cake. Interested members of the public are welcome to attend. 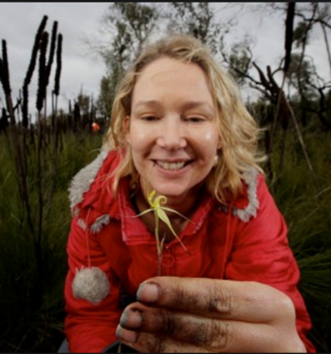 In 2005 the Native Plant Society, with the help of members of the Understorey Network and interested members of the public planted more than 400 plants as the beginning of a purely Tasmanian native plants garden. The aim of the garden was to showcase how native Tasmanian plants can make a beautiful and ecologically sustainable urban garden. The site off Conway St Mowbray, (Google Maps) overlooks all of Heritage Park with sweeping views over Inveresk and Launceston. Launceston City Council offered the site, fenced it and mulched garden beds. 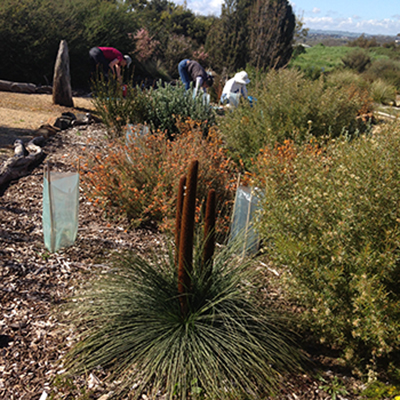 Most of the initial plantings were supplied by Habitat nursery with additions from the Australian Plants Society Inc., Northern Group nursery. The garden is part of a larger plan for Heritage Park. Below the garden site, a Eucalypt forest has been planted with the help of Forestry Tasmania, with 500 trees of entirely Tasmanian provenance. 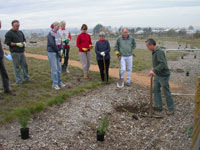 Other plantings have since taken place involving Greening Australia and the Australian Trust for Conservation Volunteers. 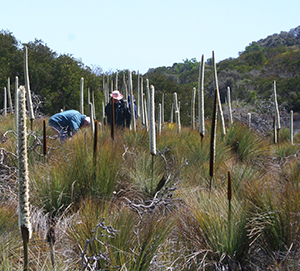 Since those initial plantings in the Tasmanian Native Garden, the Native Plant Society northern members have done numerous new plantings and improvements. 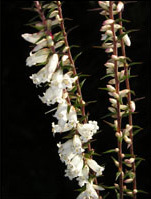 Whilst Tasmanian plants are very adaptable to harsh conditions of desiccating sun or heavy rains, adjustments and new plantings are required in any garden. of floral shrubs, small trees and herbaceous plants particularly in springtime or early summer. In is a great place to see what will grow, without much watering, in a northern Tasmanian garden. In 2012 the garden was enhanced with the addition of new features. A "dry river bed" was constructed in the southern corner to enliven a barren area of rocky ground - much of the donated site provided a gardening challenge being very exposed and having poor soil quality. Large grassed areas were dug out and more native plantings introduced to form two new garden beds. Pathways which meander around the various garden beds have been defined in a rustic manner by driftwood and rocks. Seating areas have been expanded to allow comfortable picnicking with wonderful views of Launceston city. In 2015 additional garden beds and landscaping features were added. 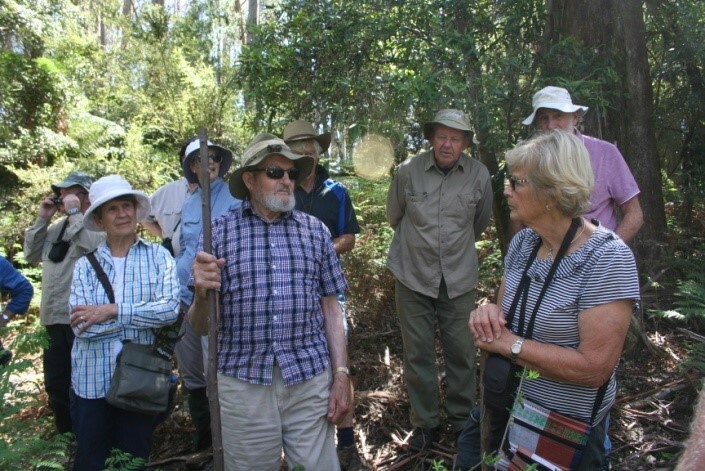 An Open day was held on Saturday 24th October 2015 with the public invited to celebrate 10 years since the Tasmanian Native Garden's foundation. 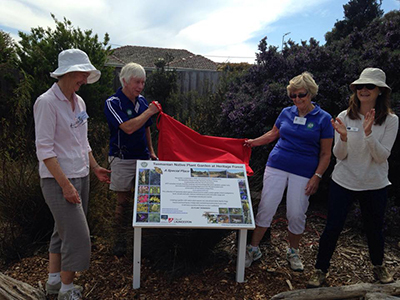 A new interpretive sign was unveiled and Plant Society's members were on hand to advise on native plant matters. Free native plants were available along with refreshments. For many years the Native Plant Society has also taken some responsibility in co-operation with the City of Launceston for the care of a delightful native plant area in the First Basin, Cataract Gorge, Launceston. 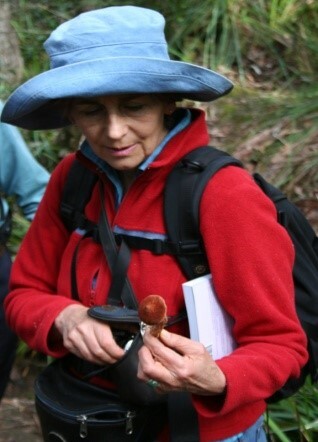 A knowledgeable member of the Society leads popular October “Gorgeous Walks” to inform the public of the many rare and beautiful native plants of the first Basin. National conferences are held every two years, each state taking its turn to host the conference. 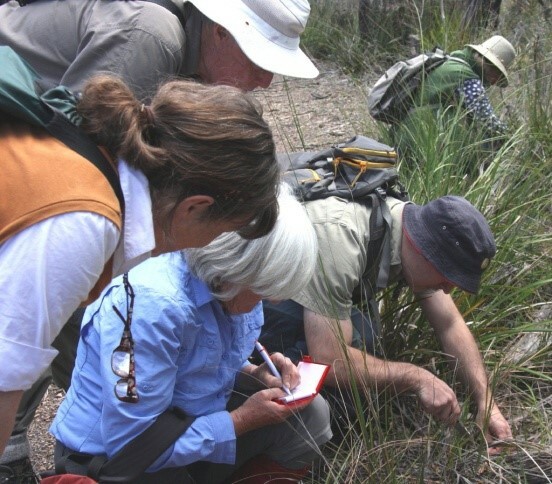 These provide the opportunity to explore the flora of other states with the help of knowledgeable local guides and to meet like-minded people from across Australia. 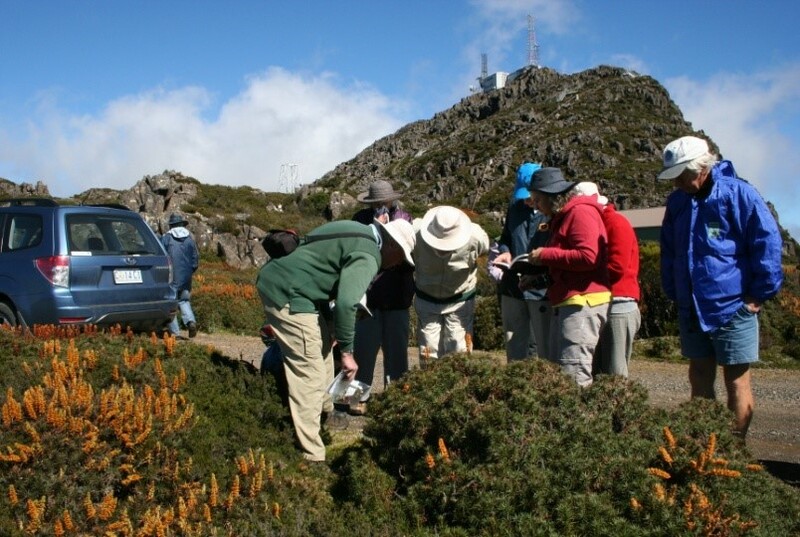 In 2018, a most successful Australian Native Plant Society of Australia (ANPSA) conference was held in Hobart with visitors from all states and the ACT enjoying seminars from Tasmanian experts and visiting superb flora sites throughout the state. Annual State get-togethers are held in different regions of the state visiting native flora hotspots. 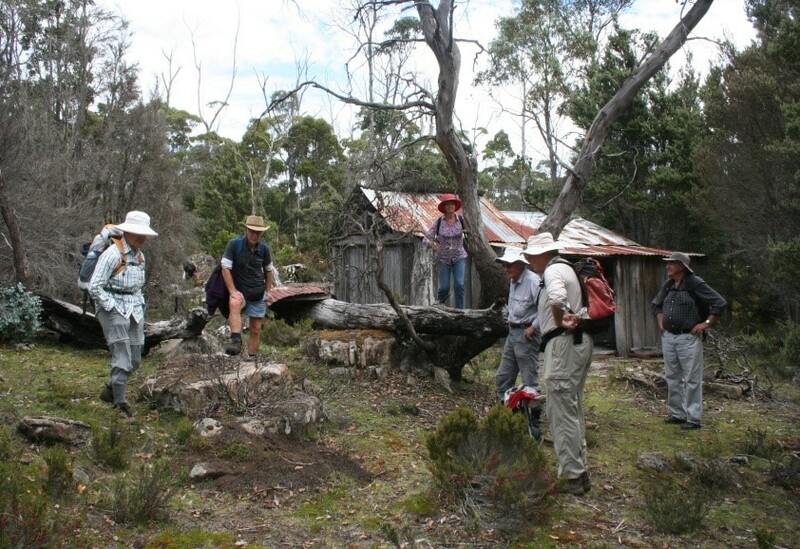 They are opportunities for members from all parts of Tasmania to further their knowledge of Tasmanian flora and to meet socially with members from other groups. Education is another of our functions. 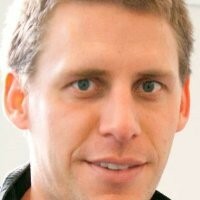 Our guest speaker program is one aspect of this, as is the knowledge we obtain from fellow members at our “club nights”. Our guest speakers regularly provide fascinating talks on a wide range of topics related to native plants (see ‘Meetings’). 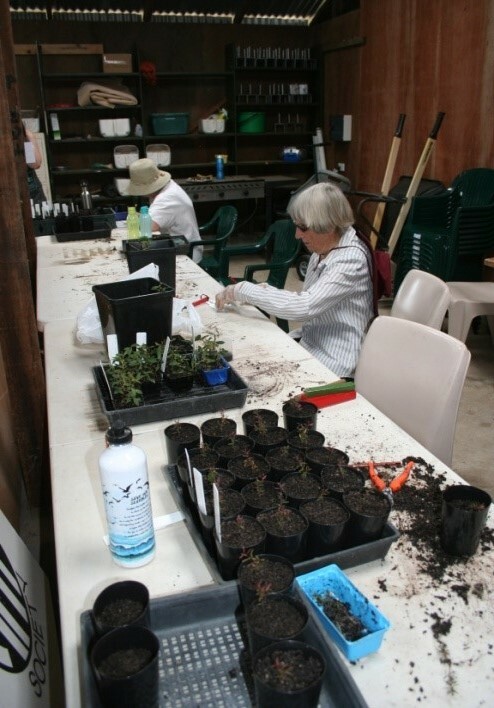 Other education activities include regular propogation sessions at our nursery, excursions and annually, participating in ‘Blooming Tasmania’. 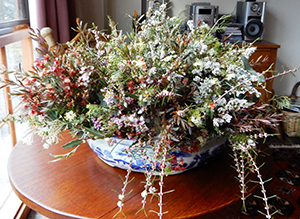 Blooming Tasmania is a popular and practical way to showcase the splendid spring display of Australian native plants, the variety of activities offered by the three native plant groups across Tasmania and to address questions direct from the public. This is held towards the end of September in the Albert Hall, Launceston.